Hi there, I am an artist looking to make a structure out of crystals in which it is very important to me to maintain the integrity (vibration, healing power) of the crystals. I understand that it is best not to glue, but I am wondering if there is an appropriate glue to join crystals to each other, and if not is there another way to do this? Can you please also tell me materials that crystals are happiest to interact with? Many thanks. Thank you so much for your question about the best way to put together an artistic structure using crystals while maintaining their healing and vibrational benefits. You mentioned that you thought using glue was not appropriate when working with crystals. I have often used glue with crystals and have found that it does not have a negative impact on their energy. I have never created a structure but I do use glue for jewelry and also if I want to attached crystals to another object (for instance a wooden wand) and I have never felt the crystals lose any of their healing powers. I would not recommend using permanent type glues (like Crazy Glue) since I have found that those can damage the crystal - and if you change your mind it is hard to get off. I like clear glues like they use in schools and my favorite is a glue gun. I have found that the crystals hold well and if it does come apart you can peel the glue right off with no damage. Check with a local craft store and they should be able to advise you on the best glue. Depending on your structure you could look at using wire - like the type that is used to wire wrap crystals. Crystals particularly love silver and copper. You might also use glass or wooden structures to hold the crystals - live bowls, vases, etc. I would steer clear of using plastic since I have found that plastic can neutralize the energy of the crystals. For instance if you have ever received a crystal in a plastic bag you typically don't feel the full influence of the energy until it is removed from the plastic. 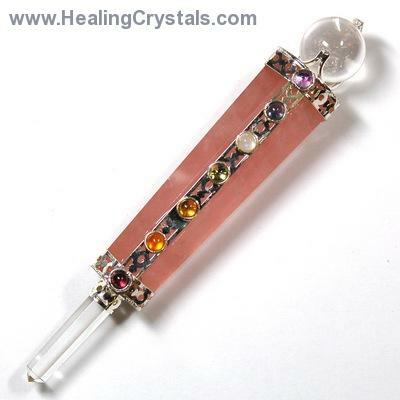 Crystals are natural substances and they respond best when working with other natural substances. I hope that my response helps and inspires you when working on your structure. I also hope that you will post a picture on our Facebook page when it is created since I'm sure that our community would love to see it. Please let me know if you have any other questions.